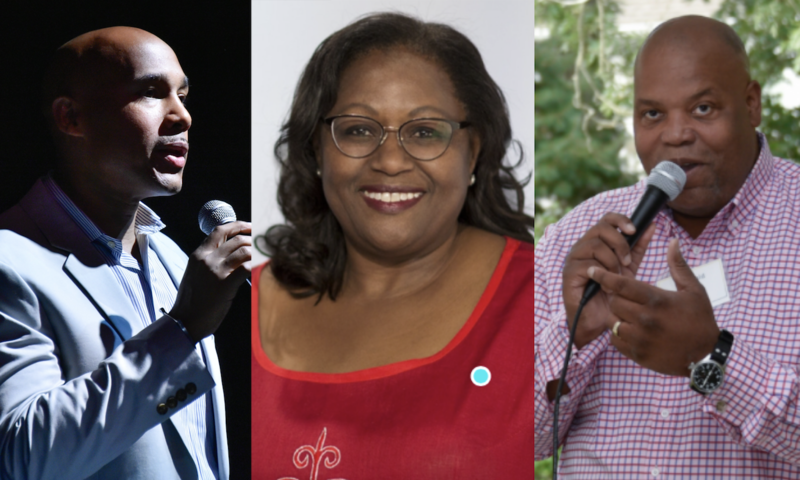 David Howse: Judith, you’re the board chair of Arena Stage in Washington, DC, and Reggie, you’re board chair of McCarter Theatre in Princeton, New Jersey. How long have you each been affiliated with your organization? And, as you think about that, why did you get involved in the theatre and what made you say yes to the board chair role? Judith Batty: I grew up going to theatre in New York, and when I moved to DC I became a frequent visitor to Arena. Around the end of 2009, the opportunity arose to join their board, and I jumped at it. I was still working then, but I was asked to be board chair when they found out I was retiring. “Oh, you’ll have time on your hands.” I thought about the request a long time before I finally said yes. I’m glad I did. Being board chair is a major time commitment but it is very rewarding. At Arena, you serve one year as chair elect, three years as chair, and two years in leadership as the immediate past chair. It’s a six-year commitment. I am currently in my last year as chair. David: How about you, Reggie? Reggie Browne: I am the interim board chair at McCarter. I joined the board in 2012, and I’ve been on the executive committee for the last two years. An illness came over our current chair, and, as the vice president, I was asked to fill the spot. I assumed that obligation happily. I’ve been in this role now for six months and I anticipate being here for a period of time. I wanted to have an outlet of my artistic interests, and theatre was my first engagement into the arts. It’s been a perfect experience. David: It seems to me both of you are coming to these roles with other artistic backgrounds and experiences. Given all that’s happening in non-profit leadership and the lack of diversity not only at the executive level but also at the board level, I’m curious to hear what you think is changing. What are you seeing? What was your charge when you came in? What are you hoping to see change during your time? Judith: Arena was founded in the 1950s as an integrated theatre company. Consequently, the board has a long history of being fairly diverse, which it was when I joined. In fact, I am not the first Black chair. I am the first Black female chair, but there was an African American male chair in the nineties. The governing board has a number of African Americans, and I would like to add Latinos to it. This year, we created a Young Patron’s Board for patrons between twenty-five and forty years old. I am happy to say we have somewhere between twenty-five and twenty-eight members. It’s a very diverse board, and includes Latinos, Native Americans, and African American members. David: Reggie, have you had a similar experience? I’m also curious about how you lead when there is a diverse group versus when there’s a more non-diverse group. What is the board make-up at McCarter? Reggie: McCarter has long had a leadership position in the theatre landscape in terms of diversity and diverse programming under our artistic director and resident playwright, Emily Mann. McCarter’s board is reflective largely of the community. We’ve had an African American chairperson before me. We’ve had a number of women in leadership positions. The current president who is on temporary leave is female. McCarter’s board is truly balanced. From the perspective of the need for diversity, we sincerely try to engage various demographic groups to expand engagement. New Jersey has a very high concentration of Asian and Indian populations that the theatre tries to attract; we want to do more in underrepresented groups. But from African American voices and African American actors, McCarter has been a leader. That is what first attracted me. As board chair, I definitely continue the effort to support the staff to be free and comprehensive in their programming choices and take risks to reach broader audiences. As board chair, I definitely continue the effort to support the staff to be free and comprehensive in their programming choices and take risks to reach broader audiences. Judith: I ditto all of that. I have a similar challenge to Reggie’s Asian and Indian challenge. DC has a large Latino population. We’ve had Latino programming that has done well, but we have not been able to attract many Latinos to the governing board. I have a few prospects now, which hopefully will work out, but that’s something we’ve been trying to achieve. Reggie: Our issue is getting patron support financially. We are somewhat unique as we’re one of the few producing theatres that is nested within a university community: Harvard, Yale, McCarter at Princeton. I think there are a couple in California in that situation. But we’re independent and our issue is fundraising. We just did a very successful campaign of ten million dollars. First time we tried this in a while, and the outcome was great, but we still need to expand the umbrella of support for various communities. That’s the challenge with the changing demographics of the theatre. We have a large-capacity theatre, greater than one thousand seats at our largest, and we have to think hard about what goes on stage versus the demographics of the patrons in the seats. 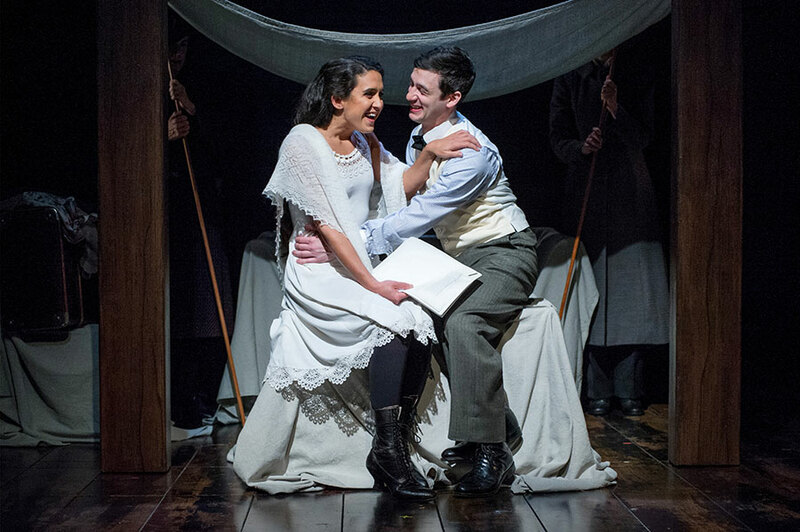 Emily Shackelford and Max Wolkowitz in Arena Stage's Indecent. Photo by C. Stanley Photography. Judith: Our capacity rate is fairly high compared to other regional theatres. However, our audience is getting older. Also, demographics in DC are changing. These are key reasons the creation of the Young Patron’s Board is so timely. A top priority for them is to attract their peers to the theatre. David: How are people thinking about the changing demographics, both in terms of the audience and who is on stage and what’s being presented on stage? Reggie: I think the change in demographics and audience composition is reflective of how people have become accustomed to being engaged. The competitor to live performance is on-demand video and on-demand activities where you can engage in different ways—and instantly—and in your living room. What we are seeing at McCarter is a change in demographics and in interest. Our average subscriber is older, definitely grayer. But what we’re challenged by is how to attract younger families and young professionals. From a board perspective, we want to encourage risk-taking in programming to reach new audiences, to tell diverse narratives. Financially, it is difficult to justify the risk without growth in diverse patrons that we can measure through season subscriptions. It’s tough to get younger patrons to commit early in advance ticket sales, let alone season passes. The competition for their attention and financial support is fierce. Judith: I concur with that. One of the objectives of starting the Young Patron’s Board is to lower the average age of our audience. We also have a “pay your age” program for patrons who are thirty and under. And our DC Ticket Partnership program also helps us develop younger patrons. We offer subsidized tickets, in-class workshops, and study guide materials to DC public- and charter-school teachers. I’ve met patrons in their twenties and thirties who talk about the fact that their first theatre experience was at Arena through the program. Now they are subscribers. David: I remember a class with Professor Thomas, who’s now the president at Morehouse College, when he was at Harvard. He asked a group of people of color, C-Suite folks, whether it was an obligation or responsibility to support other leaders who look like them. A responsibility in that there’s some sort of moral or ethical impetus, versus an obligation being more of a mandate, what you are asked to do. I was really taken by the fact that half the group felt like it was a responsibility, half felt like it was an obligation. Do you think it is an obligation or a responsibility? Reggie: If you respect the person leading the charge, you have a responsibility to support them. I find time to lend my strengths and gifts to non-profit work because I strongly believe that the development of venues for diverse voices and diverse points of view, which demonstrate the fabric of our community, is important. However, it is difficult to financially support every endeavor that appeals to you. It is easy to be pulled in too many causes and directions. Judith: That’s an interesting question, David. One of the issues I find leading an integrated arts organization, which depends very heavily on charitable donations, is that people of color like to support organizations of color. I spend a lot of time convincing people of color with capacity that attending Arena is great but donating to Arena is even better, especially if we want to continue to have our voices presented on the stage. I also spend time explaining Arena’s impact in our community. If you respect the person leading the charge, you have a responsibility to support them. David: What do you think needs to happen for people of color to want to make that investment? How does the theatre respond and engage in that conversation? Reggie: You’ve got to have theatre leadership. Not necessarily from the board level, but from the staff level, engaging the community. That comes down to access and inclusion of diverse people on staff and having proper intern programs to cultivate new talent so they can rise in ranks. Barriers need to come down, and a lot of the barriers are financial—you need to be supported as you’re being educated. Without that support, you don’t have any diversity. Without the diversity you don’t have people willing to understand the message being delivered. And the message delivered has to be delivered with authenticity and not necessarily germinated by people who just believe in it, but who actually share in the personal experience. Judith: Our board and senior staff are laser focused on making sure the stage and all programs at Arena reflect the demographics of the DC population. Our challenge is educating residents about all that we do and the impact that we have. Additionally, as a people, African Americans have traditionally donated time. We will show up. We will work. But we don’t necessarily give large sums of money. In the case of Arena, many patrons believe that paying for a ticket is enough to support the theatre. As we know, the ticket price only covers a portion of the cost. So part of educating patrons is explaining that that, and that we need donations to cover the rest of the cost. 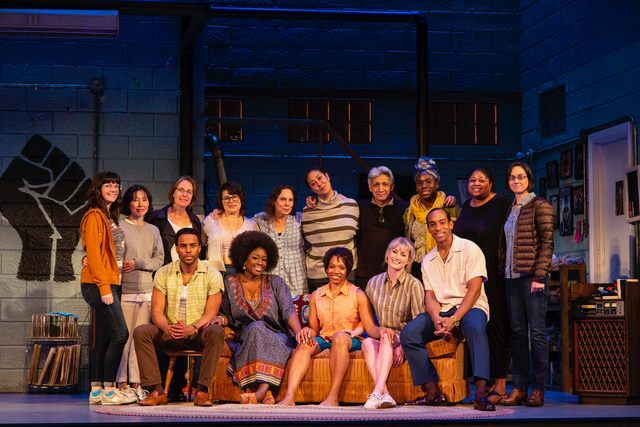 Cast of McCarter Theatre Center's production of Detroit '67. Photo by T. Charles Erickson. David: From my experience, I see a number of arts organizations—theatres included—that are what one might call virtual signaling. Sending messages, presenting work that looks like it’s reflecting. But when you pull back the layers, there’s not a fundamental change that’s happening in the organization. To do the work you’re describing takes a different kind of intention. Are you actually experiencing that, not necessarily in your own institution, but across the spectrum? Judith: I can’t speak for the spectrum, I can only speak for my institution. As I mentioned earlier, Arena was founded as an integrated theatre company, and we continue to showcase actors, directors, and playwrights of color. We also created a program over twenty-five years ago, the Allen Lee Hughes Fellowship and Internship Program, to cultivate the next generation theatre professionals. The program provides training in arts administration, artistic development, technical production, and community engagement. Through it, we have trained a number of theatre professionals of color who are still working in theatres around the United States. Arena is intentional about walking the walk. Reggie: Culture organizations live on philanthropy. And you need all types of communities to support the mission. It can’t be funneled from the very top with the expectation that the presentation of views will be diverse. There has to be a development of the entire ecosystem. Our staff is so much smaller at McCarter, and it’s working to be more reflective of the community. When it comes to cultivation of patrons and cultivation of staff, we don’t have a lot of movement—people tend to find a home and stick around. I think it’s more about how the ecosystem is built around theatres and the management. Internship programs across the board at every venue should be created, that would be accessible. Judith: A number of our staff have come out of our Allen Lee Hughes program. Internships and fellowships are key to providing hands-on experience to prepare workers for the next job. On the twenty-fifth anniversary of the program, 80 percent of the fellows and interns were still in the not-for-profit cultural world, and, out of that, 70 percent were working in theatres. David: In your role as chair of these boards, what unexpected hurdles and what unexpected benefits have you seen? Judith: I have a very engaged, very active board and one of my goals when I became chair was to move the board from more of a hands-on working board to a strategic governing board. And with such an active, vocal, lively group of people, it’s been an interesting challenge. Reggie: I would concur. I’ve had a lot of support given the fact that I was asked to fulfill this role based on an illness temporarily, and, climbing into this chair, I recognize that my theatre has gone through a series of changes. We just hired a new managing director and we’ve had some turnover, and it was a time to look at this board, to move it from a working board to a board focused on sharing, governance, oversight, and strategic outcomes. Thus far, it’s been a positive reception. Judith: It’s also been nice meeting and working with a dedicated, engaged group of people I would not otherwise know.